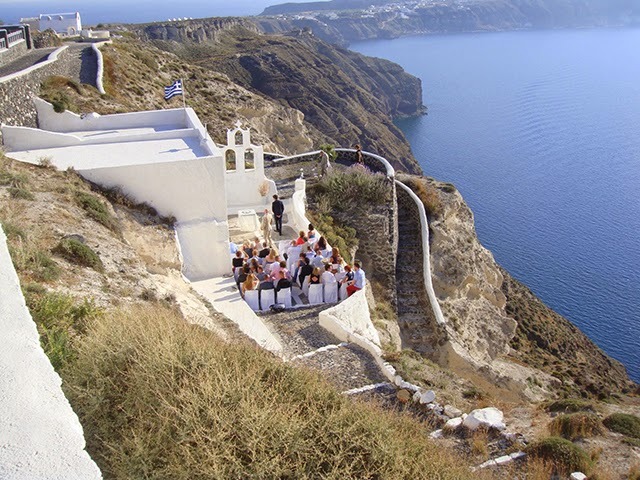 Thanks to its dramatic setting and unrivaled beauty, Santorini's volcanic Caldera is the ideal place to hold the wedding of your dreams. If you and your other half make a romantic couple, the Queen of the Aegean Sea is definitely the place to exchange vows and seal you love for good. Choose a place perched on the cliffs and feast your eyes on magnificent views over the vast sea and the imposing volcano right in the middle. The typical Cycladic white-washed houses blend perfectly with the clear blue sky and the prevailing reddish color of the rocks, creating a unique atmosphere that will charm you and your guests in an utterly atmospheric wedding ceremony. 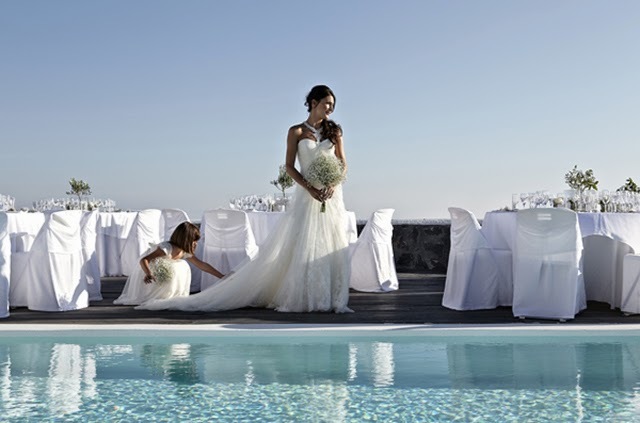 If Santorini is your idea of an idyllic wedding too, then Thermes Villas is ready to provide you with everything you'll ever wanted for your most important day. Perched on the edge of the cliffs, our properties face the Caldera and the chapel of St. Efstathios where you can get married as the sun is slowly setting turning the Greek sky into a palette of bright, warm colors sinking into the deep blue water. Now wonder why many cute lovebirds around the world have chosen Thermes Villas to tie the knot. We had the pleasure to start our summer season with the wedding of Marc and Iana, and on 27th March 2014 we organized a lovely ceremony for Alexander and Alice who got married at Thermes Princess Irianna Estate. This newly built property is a magnificent villa especially designed to accommodate all kinds of events, weddings, receptions, celebrations of more than 450 persons. Start your shared life with a thrilling experience that will stay with you...for better or for worse! Follow Thermes Luxury Villas's board Your Wedding at Thermes Villas on Pinterest. Thank you for another great article. Where else could anyone get that kind of information in such a perfect way of writing? I have a presentation next week, and I am on the look for such information. Adina Seegmiller I really like your take on the issue. I now have a clear idea on what this matter is all about..